TJ s just an ordinary fourteen year old kid with extraordinary problems at home and school: A broken up family from his parents bitter divorce, evil bullies almost every afternoon, failing grades, boring classes, snobby girls, mean teachers, cut from basketball tryouts, few friends. Life is rough for TJ Cockrell. And then that mysterious little green book had to go and throw him into the past. And not just any past, but into the untamed forbidding forests of 1802 eastern Tennessee along with the savage Indians, wild beasts, bloodthirsty robbers, backwoods ruffians, and log cabin living! Yup, it s definitely not 2011 Knoxville anymore. And he thought his present life was bad news! But TJ s adventures are only beginning. Along the way, he fights off killer beasts and bandits and braves, gains a world of confidence in himself, finds his first real love, and meets a fantastic frontier family who really has it together. When he returns to the present, he s a brand new person ready to defeat deadly robbers in his own home, beat the bullies at school, win the girl, gain friends, and make great grades. He even gets his family back together again. Sort of. In the end, the little green book is really cool. 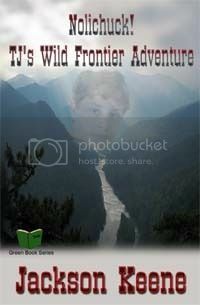 And TJ can t wait to go on another action-packed adventure into the perilous past! What I like about the book is that it touches on many topics--parents' divorce, relationships, poor grades and bully. These are mostly relevant (especially the last two topics) in today's context. What made this book special is that it also involves a time travelling! How cool is that? I really enjoyed books that involves a little time travelling and this book does not disappoint. The only thing that I have against Nolichuck is the pacing. It seemed a little slow after the time travel incident, but that's probably because the author wishes to get the readers to be accustomed to the world in the past. In addition, this book also touches a little on religion, which is prevalent in the Robertson family so it will really appeal to those who enjoy reading a little about religion. However, Nolichuck do have a little element of surprise in it nearer to the end of the book which gives the time travelling incident a little closure. I'd love to read more about TJ's mom though. Even though I believed she played a major role because of the divorce resulting in the turmoil within TJ, the book did not discuss much about her. Overall, Nolichuck is an enjoyable and exciting read which I believe will interest most young people. As he passed by in the crowded hallway, the tall blond-headed teen spotted his prey. He suddenly sped up, leaned in to the left and slammed his shoulder roughly into the back of the unsuspecting student, bouncing the other boy’s forehead off the metal wall. Click to read the interview with Mr Keene!